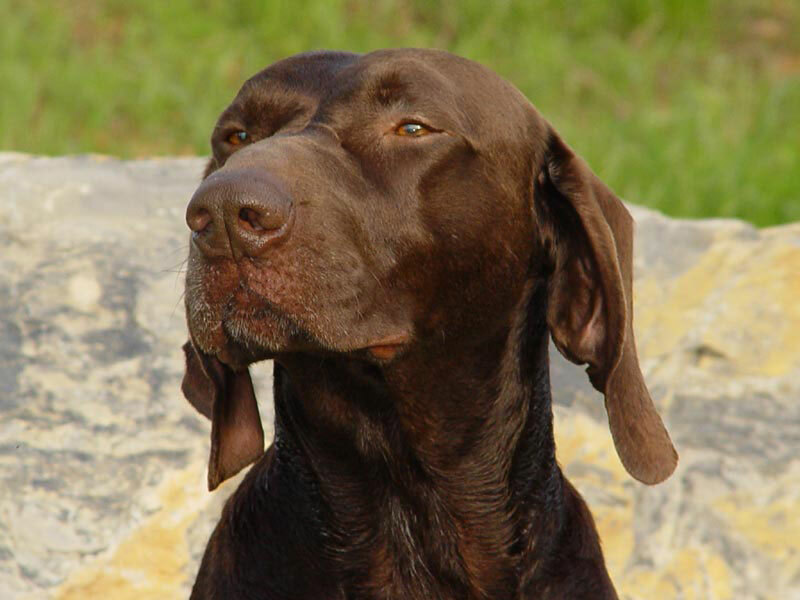 CH Fieldfine Time in a Bottle, CD, RN, CGC - "Devlin"
Devlin was a son of the great Ch. Fieldfine's Count Rambard and what an honor it was for us to have him- it was like owning a piece of history. From the beginning Devlin seemed to know that he was different- he was always the Noble, Aristocratic boy- never the goofy teenage GSP male. Devlin was our first owner handled solid liver Champion and he went on to earn his Obedience titles with ease. He was the sire of the first Mi Karma litter and his offspring figure prominently in our breeding program today and for that we will always be grateful. Keeping in mind the Noble, Aristocratic dog he had always been the very hard decision to let him go was made while he still maintained a bit of that dignity. It became a question of quality of days versus quantity of days. I know that he is waiting at the Rainbow Bridge and he is young and able to move and run pain free now. I know they have a never-ending supply of basketballs (but just in case he took his favorite) and someone who can throw them for him all day. The water is always warm and he can swim anytime he wants. Until we meet again sweet boy we will miss you and cherish the memories of you. We will no doubt catch glimpses of your spirit in your children and grandchildren that surround us.